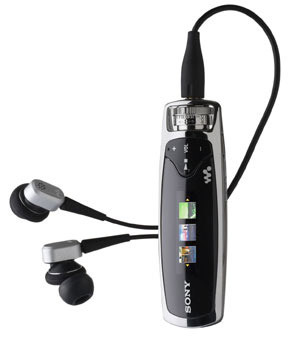 Sony, the long-standing and undisputed leader on the market of portable audio with its Walkman range, during the “digital revolution” somewhat dropped behind the cutting edge, allowing other manufacturers to make the world shout “wow” upon seeing their solutions. Apparently, refusing to put up with the current state of affairs, Sony has recently decided to take another attempt to strengthen the brand’s position in the portable audio market by releasing three new flash-based models. And these actually do follow in the footsteps of the company’s other offerings, being out of the ordinary both inside and outside, thus provoking predictable interest among broad audience and journalists, on top of all that these players are being advertised nearly everywhere these days. We will definitely take a closer look at each of the new products, meanwhile this article focuses on the flagship of this mini-lineup, the NW-S705F. 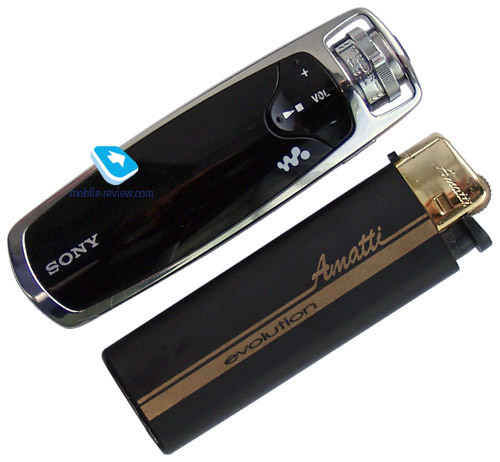 The player builds on flash-memory, comes with a color OLED display and an FM-tuner. Apart from all that it has another highlight that characterizes this offering against the backdrop of the market. To be precise, this feature has nothing to do with the player itself – it is the bundled noise cancelling headphones. 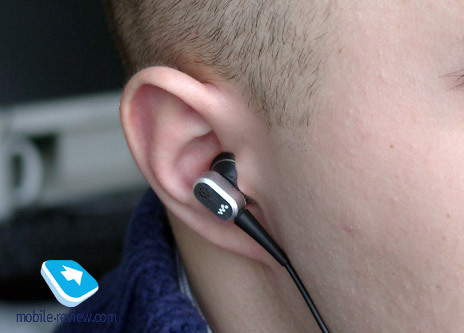 Such “frills” are not a rare occasion among clip-on and over-band type headsets, but the in-ear “form-factor” presence of this system is an utterly crucial and newsworthy fact. The fact is, metal in the chassis of just about any device coming from the family of personal electronics adds a few points to its appeal automatically. Luckily, it seems, Sony is also aware of that. And what is more, they regularly apply this knowledge to the line-up. Hence, the S705F utilizes some metal as well, specifically its chrome-coated metal / plastic in the construction ratio is almost 50/50. More details on that will come in the corresponding chapter of this review, and in the Introduction it would make more sense to tell about the specs and the player’s brothers-in-arms that come in under different digital indexes. Modeled after the latest vogue set by the market and the users themselves, the player comes with a solid storage space – 1, 2 or 4 Gb. 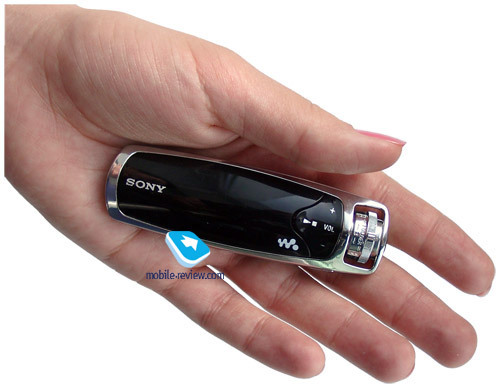 Marketers, in charge of the indexes not only for these, but the previous Sony-branded MP3-players as well, for some reason decided that it would be useful to give identical devices carrying various memory volume onboard different digital indexes. In practice, though, this it of some use only to stockmen, or, better to say, the applications managing the stock, rather than the users, who have used to focus on one index only. Really, if they are into showing storage size in the index, why don’t they do that suffixing a letter? Anyway, there is no definite answer to this question to date – it may happen, though, that Sony’s approach will prove to be the most rational one, yet I can barely imagine this outcome. As we have already mentioned in the sort of introduction here, the S705F casing is made entirely of black plastic and chrome-finished metal alloy – a zero-risk combination, make no mistake about that. Incidentally, the same mix is used in an interesting sporty player known as the S205, so it appears that over at Sony they have decided not to experiment anymore. Though, the truth is the black and silver colors have always been the company’s trademark trims, therefore, with a grain of joke be it said of course, these colors have become the classic not without Sony’s assistance. As a result the player looks utterly stylish, being reminiscent of jewellery and a sort of precision instrument. However while we were testing it, the S705F’s looks garnered some negative feedback – some people might think it’s too gloomy or austere beyond the measure. To me, the straight lines and conservative color solutions suit it – against the backdrop of great many of competitors it looks almost like Nokia 8800 faced off against Sony Ericsson W800. This model, if you like, can be even called a “player for adults”, and, from the positioning standpoint, this impression at a glance is not a poor move at all. Many overall good players boasts too trendy, youth-aimed design, even though a good share of potential buyers are already past their “best years” and now would like to make use of a more imposing-looking device. Maybe, Sony decided to play upon these very feelings – such image is amplified by the interface as well, a few words on it will be said as we go deeper into the review. As regards the build quality, we have no quarrel with it – all panels and details are well-attuned, the gaps are very tiny, at that nothing seems spongy or loose. Held in hands, thanks to the metal used here, the player feels much weightier than other similar offerings by other makers, which, again, adds to its status. In light of the casing’s solid feel, it is just a pleasure to get a grip on the gadget and play around with it. Somewhat identical impression was delivered by the original Apple Nano, but through different means, specifically the slimness, which made everybody want to twiddle with it. In the sense of the casing shape, the S705F resembles of a small fish or a spoon-bait, if you like: it is narrowed at the ends and fatter in the middle. Some special words should be said about the metal frame edging the casing and protecting the navigation block. Apart from being just another trinket here, it is useful in terms of practicality, as it keeps the player safe and untouched in case it falls down, and this is the detail that lends the player such a solid and weight feel. Back in the days, when Sony’s audio players got out of the mechanical state, they were famous for retaining a great many of shortcut buttons allowing fast access to various functions or FM-tuner settings etc. 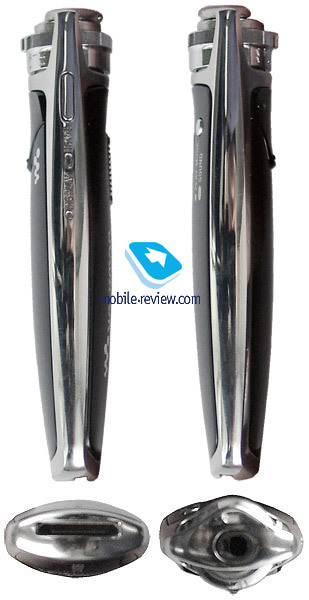 This trend is now continued in the digital models and in the S600/S700 series in particular. For example, the S705F features a three-way button, four-way two-level swiveling switch, two dedicated buttons and a hold-slider. The three-way, which is really unusual to begin with, button is placed on the fascia next to the next and stands for starting playback, pausing and adjusting volume. Design-wise it is almost like a triangle with smoothened edges. Though, an offbeat trademark swiveling block put on the top end is of more interest to us. It got inaugurated, if there is no mistake, with the E500 series (specifically the E505). In the bottom position (pinned to the end) it allows jumping between tracks back and forth. If you pull it rightwards, while holding the player horizontally, or upwards, for vertical position, the block will move along the pivot. Now it serves for navigating through folders in the player’s memory. But it is not the last thing the swiveling block is characterized with. First, the pivot it moves along doubles as a headset jack. Such rational and at that original usage of the available space is undoubtedly noteworthy. On top of that, the block is all round protected by the metal frame, letting you feel confident while handing it, unlike the bare block found in the E505 – when I had it, I had an obsession that it might just fall apart while carried in a pocket. All in all the controls on the S705F win our approval with adequately sized buttons and switches that feel solid when pressed, proved good feedback and allow for almost no wrong presses. All keys here, saving for the side-mounted button, are bulgy, or have marks on them so finding them by touch is a cinch. Anyway, this layout actually will take some getting used to – the S705F adopts really offbeat trademark ideas of the company, and this is what make the player look and feel different from other proposals on the market, yet nobody has come up with a concept better than a joystick or a five-way navigation key to date, and what’s more, the Apple’s ClickWheel is somewhat more intuitive. On the other hand, the controls of the S705F are by no means inconvenient; it will just seem strange for some time to those who have encountered a Sony-branded MP3-player for the player time. The display, found in the S705F, is another highlight of the device; at least it is very atypical of the latest and greatest gadgets that usually look all the same. The main feature of this screen is that it’s completely hidden under the glossy faceplate; moreover, its edges are impossible to see even if you take the player close to your eyes and stare at it for some time. On start up the display appears from beneath, which introduces an interesting visual effect, which is nothing new, though (similar solution has already been used in cell phones). The display builds off a color OLED matrix, yet the developers have made a wise move, tacking none of those over-hyped photo- or video-capabilities on the player. The resolution, as well as how many colors it can show, is not the data for public usage, as it seems, generally Sony turns out to be quite lazy when it comes to releasing technical specifications. However, we wouldn’t find anything groundbreaking it there, that’s for sure. The display accommodates three text lines, and the entire interface is designed in a way to fit in this space. Generally speaking, the design and color scheme of the interface go with the player’s look outstandingly well. And the truth is, it is a quite rare occasion – the last time I had this feeling was the quality time with the recent Jukebox by Philips, and I won’t get much surprised if this seemingly unsophisticated combination has been delivered through the hard work of graphic designers. The interface is quite quiet – its creators obviously don’t set out to impress you with flashy colors or a wide variety of color schemes. The color palette for text and icons is restrained. The fonts can’t be just overlooked here – the size and design fit this display, as working with a screen this small, it is not a big deal to make one mistake and turn all captions into something illegible. Thankfully, over at Sony they haven’t let this happen – texts on the screen are quite clear and will barely give you a hard time reading them. “Third-party” icons that have nothing to do with the player’s interface are the Album Arts, uploaded onto the player when you purchase music in Sony’s branded store. The display can show three of them at a time, but don’t fall into dreaming just yet – you won’t see a detailed image, so that is more of a marketing move. The player's main menu is viewed as simple monochrome thumbnails. The horizontal menu layout is nicely tuned to fit in the controls scheme based on the swiveling block, at least I didn’t experience any hardships managing it. 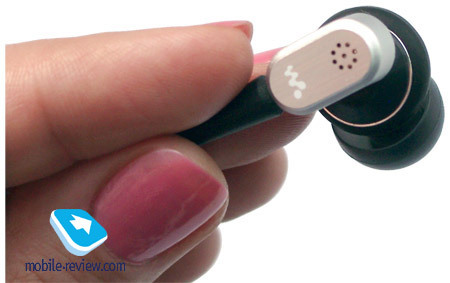 Menu constituents: Search, Jacket Search, Noise Canceling, All Songs, FM, Playlist Select, Intelligent Shuffle, Settings. Intelligent Shuffle. Manageable shuffle mode. Settings. Allows setting up all features of the player. Includes the following sub-menus: Sound, Clear Stereo, Sort, Jacket Mode, Display Screen, Advanced Settings. Sound. Select equalizer presets here, manually adjust the bands, choose operation mode of VPT stereo widening system. Clear Stereo. Lets you turn on/off Clear Stereo additional sound processing system. Sort. 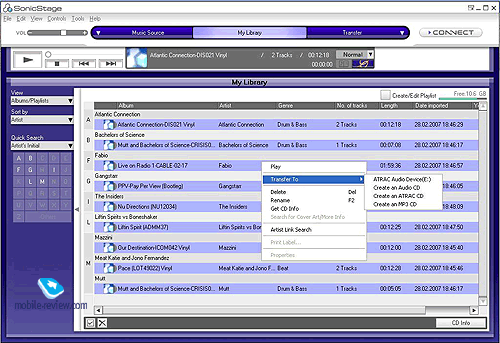 Sort tracks by album, artist or album and artist. Jacket Mode. Allows choosing album art display mode. Display Screen. Set up on-screen elements shown in each of the modes (file info, clock, visual effect) here. Advanced Settings. 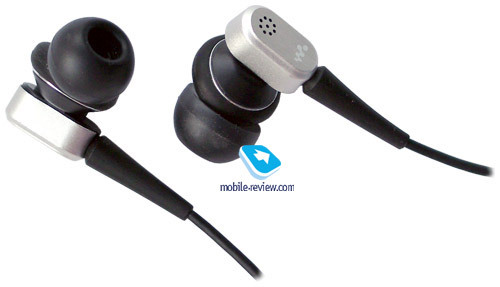 These lead to: date, time, power saving mode, AVLS mode, volume control type, microphone sensitivity. Also, via this menu you can check out system information and adjust USB connection. 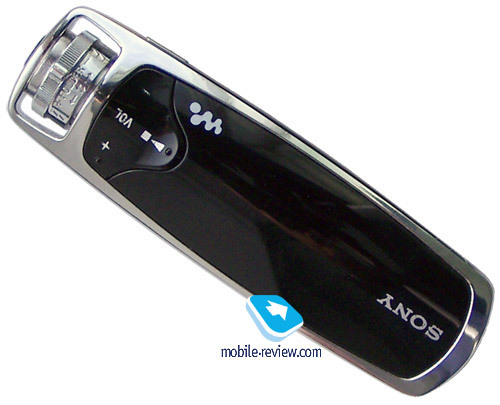 The player is powered by a built-in Li-Ion battery, whose specifications remain undefined – both Sony and Goolge search keep mum on the details. Yet the claimed battery life is truly admirable – 50 hours (though, for ATRAC), provided by the proprietary Stamina technology has already proven itself on plenty of portable gadgets. When we tested it, partly charged player worked for about 40 hours straight. The battery is charged via USB connection, the same means are used for synchronization with PC. It’s newsworthy that Sony is famous for its propensity for proprietary interfaces, and this case is no exception – the company has equipped the player with a 22-pin cable, therefore all owners should handle it with utmost care. It takes the battery about 2 hours to charge from empty to full, which is an average figure, though taking account of the fact its lifetime and the power source (USB) it can be called decent. Your home PC will identify the S705F as a removable storage device, allowing for usage of the player for saving any files, which may take the entire memory volume. It comes as no surprise that using this method you won’t be able to upload music onto the player, or, you will actually, but The S705F just won’t recognize it. 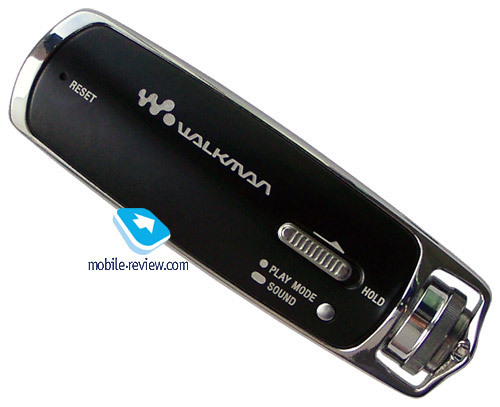 Data transfer speed is around 1,5 Mb/s, which is quite average, as it could put up better performance on this front in light of the claimed USB Hi-Speed. For the purposes of uploading music and album art onto the player you are limited to the company’s very own application - Sonic Stage, this time, version 4.2, even though I could not figure out any striking differences from the earlier versions, the new one was blazing fast on my so-so notebook. Data transfer speed via Sonic Stage is roughly the same as that for direct upload, tracks don’t get converted into ATRAC format, which is obviously a step up for Sony, that was quite predictable, though. The bundled turner sports standard features, at least for a portable device: auto and manual tuning, ability to save radio stations (30 slots which is quite enough) and switch between them. The reception quality is somewhat average, even though it is okay for picking up most stations, but only in radio-friendly conditions. On top of that with the S705F you can avail of a rare and maybe the trademark ability to “stop” radio broadcast by pressing the Stop button – in some cases it may come in handy, aside from that, we are just happy this feature is in here. Active noise cancellation is getting to be a trend in portable audio devices – just take a look at the recently launched Jabra- and Creative-branded headphones tailored for use with MP3-players. Just in the spirit of the times, as one of the selling points of its player, Sony has decided to introduce the active noise cancellation system. And this is the way it works in the S705F (and in other S700 Series players as well) – the system turns on only if you’ve plugged in the default headphones. The microphone on them registers all ambient noises, then sends them to the player, where they are analyzed and after all these stage the player includes these wave into the signal transferred to the headphones but opposite in phase, and thus cancels the noises. A thing of note is that the microphone sensitivity and, hence, noise cancellation intensity may be adjusted manually. The system gets activated only when listening to music or radio, so you won’t be able to use it with the player paused or stopped. Noises are cancelled with the S705F outstandingly well – when tested in underground the player displayed some great results. A part of the credit here goes to the headphones themselves, since they are armed with plugs that decrease level of noises on their own as well. The sonic experience delivered by the S705F deserves some warm words, which is nothing that would make me round my eyes, though, taking into account the company’s reputation in this field, even against the backdrop of a sort of disregard of the professional audio market over the past few years. In our tests we put the player through its paces using various music genres and artists from Kid Loco to Gangstarr, and a handful of headphones, specifically the bundled ones, KOSS Porta Pro, Technics RPDJ-1210. The S705F outputs juicy sound, even though it remains penetrating and “airy”. High frequencies sound pretty soft, without that blurriness or abruptness characterizing MP3. It seems that for this we should thank company’s very own developments in the sound processing department: Clear Stereo and Normalizer. The VPT feature is also onboard; however this is a thing for fans only, as it doesn’t bring anything groundbreaking. What is great about the player is that the default headphones put up excellent reproduction of basses, and if I make no mistake, this is the second case in my career when I do not recommend replacing the bundled headphones, since they are involved into noise cancellation system as well. Again, one of the player’s draws is the manageable 5-band equalizer and a stand-alone bass control. With the two-band setup of the HD-5 in mind, we are calling this fact a serious improvement giving the users a whole lot more of comfort. All up, Sony has come up with a very competent “player for adults”, that can make up in the eyes of the brand fans for the past letdowns, like forced files recording, malfunctioning software and very limited sound setup capabilities. Some especially warm words should be said about the great looking design, metal in the chassis, quality default headphones and an adequate implementation of noise cancellation system. As regards the price, just Sony always does with its offerings, it is a tad higher than the counterparts under different brands, yet seems justified enough. In Moscow the S705F with 2 Gb onboard is retailed for 200 USD, while for the S605, lacking an FM-tuner and noise cancellation, they charge 30 USD less, but this gap is miserable, as you’ll spend almost twice as much on good noise cancelling headphones, if you have to buy them separately.